While existing HRP8811-A75-HD style top wing posts are considered extraordinary to other versions of top wing posts, have continually met rigorous specifications and have no documented failures in standard use, Hepfner Racing Products (HRP) has worked in conjunction with The Sprint Car Safety Council on an even superior sprint car top wing post using a heat treating process during manufacturing, which after thorough testing and review has been approved for use by The Sprint Car Safety Council and most all National sanctioned series and tracks beginning at the start of the 2019 season. These revised posts will now have a recognizable proprietary “approved” decal along with stamped “H” and as such will be the only HRP manufactured top wing post sold. Owners of current (non-labeled) HRP8811-A75-HD top wing posts should check with their sanctioning series/track as to their specifications and rules for 2019 as they still may be allowed for competition. 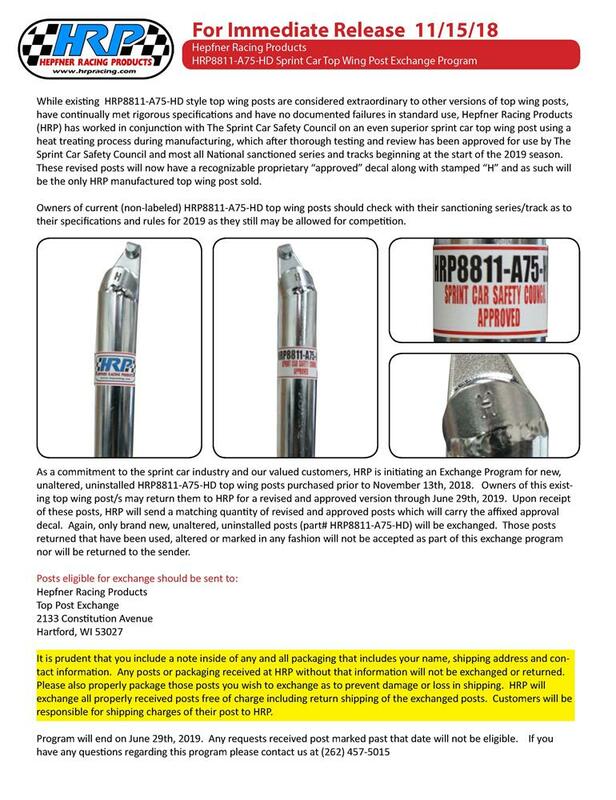 As a commitment to the sprint car industry and our valued customers, HRP is initiating an Exchange Program for new, unaltered, uninstalled HRP8811-A75-HD top wing posts purchased prior to November 13th, 2018. Owners of this existing top wing post/s may return them to HRP for a revised and approved version through June 29th, 2019. Upon receipt of these posts, HRP will send a matching quantity of revised and approved posts which will carry the affixed approval decal. Again, only brand new, unaltered, uninstalled posts (part# HRP8811-A75-HD) will be exchanged. Those posts returned that have been used, altered or marked in any fashion will not be accepted as part of this exchange program nor will be returned to the sender. It is prudent that you include a note inside of any and all packaging that includes your name, shipping address and contact information. Any posts or packaging received at HRP without that information will not be exchanged or returned. Please also properly package those posts you wish to exchange as to prevent damage or loss in shipping. HRP will exchange all properly received posts free of charge including return shipping of the exchanged posts. Customers will be responsible for shipping charges of their post to HRP.